When you turn the big "40", compare yourself to wine, you only get better with age. So celebrate saying good-bye to the 30's by having a 40th birthday party on yourself. But don't consider using all those black decorations, use our bright multi-colored decorations. 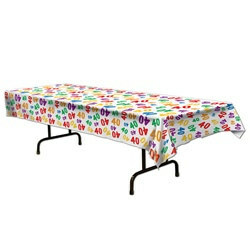 The 40 Tablecover is just one of our many multi-colored decorations we have available. The color of this 40 Tablecover is white with multi-colored symbols of 40's printed on it. The 40 Tablecover measures (54) inches wide by (108) inches long of plastic material and fits most rectangular tables. This 40 Tablecover would also go great for a celebration of a company being in business. Love the bright colors and the big 40s all over the tablecloth. This will be used on the table with the cake and gifts. Very happy with the quality and price.